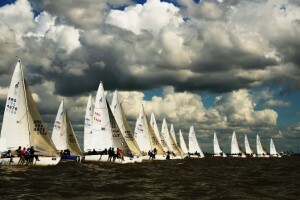 Only one week left until the 2011 J/24 World Championship, one of the most important events of international yachting. There are a large number of registered teams from around the world. In fact, there will be 60 boats competing — Argentina (26), Australia (2), Brazil (5), Chile (4), Great Britain (1), Italy (4), Peru (1), Uruguay (8) and the United States (9). Furthermore, we will receive the best skippers of the world, including Tim Healy (United States) and Mauricio Santa Cruz (Brazil). We will also have Juan I. Grimaldi and his crew joining us; they are the last J/24 Argentinean champions. This weekend the J/24 boats will have a Pre World Chamiponship that will be held in the Yacht Club Argentino. The regattas will start at 13:00. We hope this competition will be a good training for the real championship. Mr. Marcel Bacqué will be the Chairman of the 2011 J-24 World Championship and the members of the Organizing Committee will be Mr. Sigfriedo Spitzky, Mr. Roberto Authier and Mr. Gonzalo Heredia. Mr. Teodoro Kundig will be the Principal Race Officer and the Jury will be integrated by the judges Emilio Feliu, Willii Gohl, Thomas Rinda, Johnny Mac Call and José María Sánchez Pagano. The Appendix P Judges will be Johnny Mac Call, Gonzalo Heredia and Andrés Anca. The measurement will be lead by Timothy Winger and Alexander Finsterbusch of the International J/24 Class. For the verification turn please send us an email from 11 to 19hs from Thursday the 10th, you can also do it personally or by phone. Any email received before that date and hour will be discarded. For more information please check out the site: http://www.j24worlds2011.org.ar/Content.aspx?Id=1282. Don’t forget to follow us by Facebook (2011 J-24 World Championship) and Twitter (J24_2011)!